The Care and Concern function is very nice. This way, if classmates want to share important things in their lives, they have the opportunity. Also, we will get correct information instead of hear say. Had such a good time at our "mini-reunion!" It was an evening of fun and catching up and renewing old friendships. I do want to give a big "pat on the back" to DAN GEUDER for all the time and effort he gives in the planning of our events, but especially for building this website! 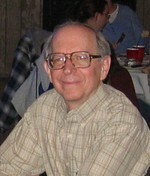 He is completely responsible for all of the updates and maintenance of the site. I know his talents haven't gone unnoticed, but I think he deserves a special shout-out for all he does to keep us together and the Reunion Committee in line and on task (which is sometimes nearly impossible)!! Kudos, in fact, to the entire Reunion Committee! I am proud to be a part of it! See you all at Farmers' Fair! Almost forgot --just one complaint... Dan, I think something's wrong with your camera... it seems to make us look o-l-d!! Our Devil has won 1st place !!!!!!!!!!!!!!!!! 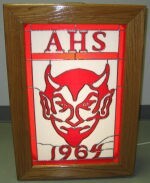 Congratulations to Sandy & Melvin for getting a first place ribbon for their stained glass AHS Red Devil of 1964. Of course it won 1st place! It's awesome! Congrats, Sandy & Melvin! Hello to All! I got to visit with Sandy and Mel a few weeks ago while they were in FL. Had so much fun! Please post the reunion dates as soon and you figure them out for me. I'm going to try my darnest to make it up for a visit. 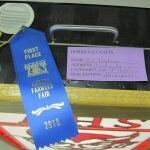 I had such a great time last year during the Farmers Fair. I sure hope all who can, will attend our mini-reunion in September. We seem to have a lot of fun and it is great to see everyone. Since joining this reunion committee I have regained the friendships I had during the 60's and it is a wonderful feeling. Hope to see you at the Applewood on Saturday, Sept. 10th! Well of course I'm coming to our reunion Sept 10th, it is always great to see everyone & we have such a good time together. We have so much news to tell you about our "DEVILS DEN" and yes we are going to have a "60's BASH" next year, everyone has been asking about it & so it is in the baby stages now in planning. SO COME JOIN US SEPT 10th 6pm AT THE APPLEWOOD. Everyone, just wanted to let you all know that Phil Detmer is back in the hospital. He is having some breathing problems and is on oxygen full time until they get it taken care of! Please keep Phil in your thoughts and prayers as he fights thru this! Hope to see all of you, that can make it, at the Applewood on September 10th for our annual reunion! If you will be here for the Farmer's Fair please let someone know so we can get together with you! We are having a hospitality room on second street that will be open all during the Fair for anyone who attended Aurora High school. Please stop in and visit with us if you are in town. Mona Rider has already told me she will be here for the Fair so stop in to visit with her and all your former AHS classmates! I am really looking forward to our mini-reunion on Sept. 10th. We have such a good time. I was really sad to learn of Joe Connelton's passing. It just makes you more aware of how precious our lives are and to spend as much time as we can with people we care about. It will be nice talking with old friends again. I don't know about you, but I like remembering the "good ole days", it makes me feel younger. Again, we had a great time at our "mini reunion", it was great in seeing everyone again. We had several surprises when Bucky Burgess, Donna Peters, Alvina Callanhan, Virginia Grathwol showed up. 1st time for them at our mini, and again were being told "We will be back." See if you missed it just what you missed. Another great time. Pam, Donna, Lynn, Bonnie & I continued our reunion at Hollywood we spent the night at the hotel (I didnt say we slept). Played in the casino till about 3am, and pushing those buttons really takes alot out of you makes you really hungry. So we ate and then returned to the casino about 5am we did go to the room. Laughing (I hope no one was really trying to sleep as we past the rooms in the hall), getting lost, but we did finally find the room. Put our "jammies" on, talked (Pam, Donna, & I kinda dozed off, but not for long). How could you doze off when Bonnie is trying to tell a joke is laughing so hard, she cant get the punch line out. Lynn with her "bunnie" slippers going down the hall getting ice!! We laughed till we cried!! Told each other all our "secrets," and finally got dressed cleaned up the room, our "food" junk we had brought, looked for some ones sock (cant remember who's, found it) went to breakfast. Donna then took us to our cars which we had left at Bonnies. Leaving with "it won't be 47yrs before we do this again." Did we have a good time, I know I did and I'm very sure I can speak for the other 4 YES, we had a great time at the reunion & all night long. All I can say is the only thing that was missing was Hope & Sandy W., then all us girls that hung together at school, would have been hanging around again for the night. You two were missed & maybe next time you will join us!!!!!! Just wanted to tell everyone that I really enjoyed seeing you at our mini-reunion on Saturday night. We really had a good turnout. It was especially nice seeing classmates that we have not seen in a long time, Donna Peters, Alvina Callihan, Virginia Grathwohl and Clyde (Buckey) Burgess. Since I started helping with the reunions, I have become re-acquainted with all of you and I am so thankful and feel so fortunate to be a part of such a good thing. We have all changed in looks, but when we get together, it seems to knock out so many years. To the ones that come, thank you for the good times. For the ones that don't come, we truly miss you and hope you try to come the next time. Hope to see some of you at the Aurora Farmer's Fair. Look for our reception room on Second Street. It will be in the Schuck building, (The Devil's Den). Several classes will have displays to view, plus, we will have refreshments. Please stop in and visit. Also, thanks Sandy, Pam, Donna, and Lynn for such a good time at Hollywood. It is a time I will never forget. Sooo much fun! So I didn't return your call.............I believe that I recycled you phone #. My apologies. We have plans to go to the coast of Maine on this weekend Hope all of you have fun. I am sure that you will. Sorry you could not make the reunion. Perhaps, if we have another one, you will be able to attend. It was nice speaking to you on the phone. I did wonder why you did not get back with me in the time span that you had stated, now I know. Your not the only one missing the cold. Here on the East coast of Fl. it got down to 32 last week. Just like home. Been a cold winterr down here in Cocoa Beach will be glad to get back to good ole Indiana. Love it down here for the winter, but you can keep the summer heat and humidity. Don't know if I will make the summer park thing, as I bought a house in aurora and in process of fixing it to my liking. With the recent passing of Pam Walker Gleason & Renee Molter (5 since our 50th reunion)-32 classmates in all, has brought to mind how quickly time passes. Most of us have lost our parents, some of us our spouses, siblings, friends and of course our classmates. We will love and miss them always. We are now at the age that our time is finite. As our yearbook stated from the lyrics of the Byrd's " Turn, Turn, Turn" or/ Ecclesiastes 3:2: "To everthing- there is a season...A time to be born...a time to die." Whatever time we have left, we need to enjoy every moment and the memories of joyful times. Thinking of all of you and wishing you happiness. Just wanted to let you all know that Dan Geuder's mother passed away Monday at the age of 97. She was such an inspiration, always had a smile for Danny's friends, and loved going out to dinner on Fridays with him at Big Daddy's restaurant, where some of us got to know her so well! Visitation is Friday, October 23 at 12:00 noon until 2:00 at Rullman Funeral Home, Aurora, with services immediately following. More details are available on Rullman's website. Our thoughts and prayers are with Danny and his family. Sorry to hear about your mom. How wonderful to have had her for 97 years. I lost mom at 91 a few years ago. As time passes may you look back on many wonderful memories. Will be thinking of you on Friday. God bless.